The following sonnet was written by Mary during her incarceration in Fotheringhay. The next poem is an ode to the death of her first husband, the French king Francis II. 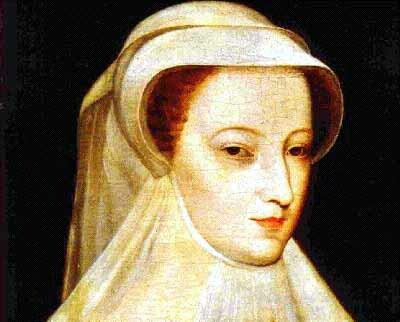 Although Mary was fluent in both French and old Scot she preferred to write in French which was the language of the court, and considered more sophisticated. If you are interested in Mary's poetry, please see the book by Robin Bell "Bittersweet Within my Heart", detailed in our "Book Review" section. Marys first husband, the young French King Francis II died suddenly of an ear infection aged only sixteen. Mary, a year older than him, wrote the following poem in a state of great dejection, having lost the only pure love that she would ever encounter. Passe mes meilleurs ans. I'll pass my best years. Qui, mon coeur et mon oeil, Than, O my heart and my eyes! Vois en bière et cercueil? I see where his bier lies? D'une extrême tristesse Of the most grievous hurt. Qu'en regret et désir But regret and desire. Ores mest peine dure; Already is my plight. Mest nuit noire et obscure; For me is darkest night. Qui de moi soit requis. That I need make it mine. Si ma douleur efface; To drive away my ill.
Sont mes plus déserts lieux. Have lost the taste they had. Ou soit pour la vesprée, Or at the evening shadow. Le regret dun absent Grief for his loss to me. Viens à dresser ma vue, His image comes to me. Je vois en une nue; Up in a cloud I see. Comme dans un tombeau. I see his funeral bier. Je le sens quil me touche; And I can feel his touch. Toujours est près de moi. He is near me always. Pour beau quil se présente; Unless he is therein. A cette affliction In my cruel dejection.